The only element of our trip that qualified for “Plan B” status was that the weather did not match my hopes for sunny seventies. (I know, boo-hoo. Get over it, right? Didn’t I tell you that this is a very gentle parable?) We timed our trip for a temperature dip. Perfectly. So, instead of beaches and swimming pools (Plan A), we worked out a Plan B. 1) My desires and dreams will not magically come to me; I have to go get them (if possible). The day after our arrival we awoke to cloudy skies and chilly temps, but thanks to modern technology we knew that there was sunshine up the coast. After a short drive to find some sun, we were walking barefoot on the beach. 2) Check my attitude by checking my reference points. Yes, it was cooler than we would have liked in Florida, but it was also much warmer than the weather we left behind in Chicago. Similarly, I can compare myself or my life circumstances to a mental ideal and come up empty, or I can fill my mind by counting blessings and thank God for a rich and abundant life. 3) Adjust my activity when necessary. And sometimes it is simply necessary. 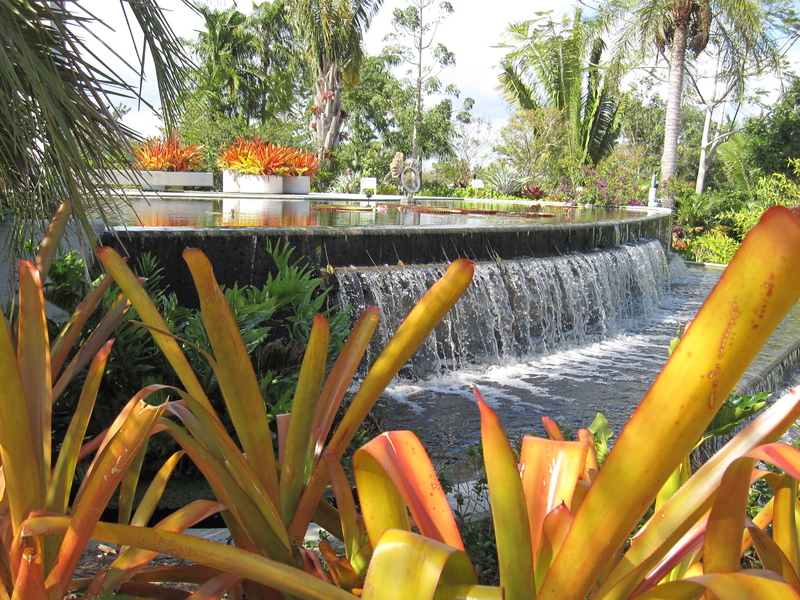 The photos in this post were taken at the Naples Botanical Gardens, a thoroughly enjoyable Plan B activity. 4) Sometimes “B” is for Bad. We had no “bad” moments during our trip. In life, however, some Plan B events are devastating: illness, loss, broken relationships, divorce, unemployment. The best we can do is to face them, adjust, learn from our experiences, and move on. 5) Ultimately, “B” is for Better. The final adjustment to our plans was an extra day in Florida due to a snowstorm in Chicago. It was the glorious day we had desired; perfect weather, lunch on the beach, flip-flops, children splashing in the surf, and walks on warm sand. It restored our souls. Ultimately, God’s perfect plan prevails. 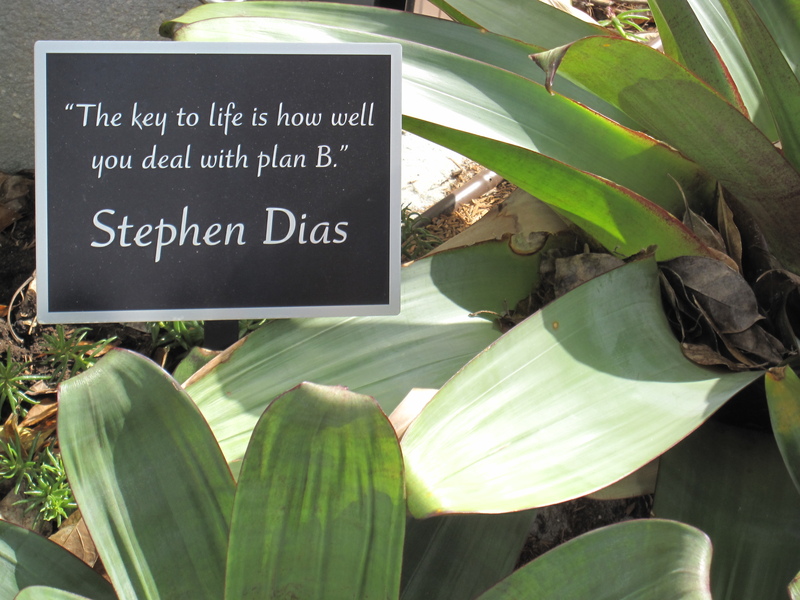 What have you learned from life’s “Plan B” moments? 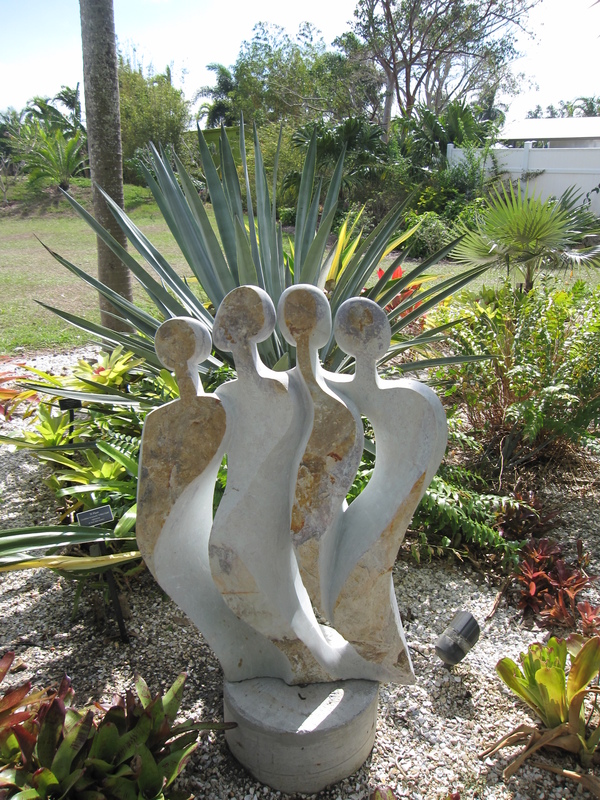 Gallery | This entry was posted in Dreams, Hope, Life, Perspectives, Thanksgiving and tagged Beach, Desires, Dreams, God's plan, Jeremiah 29:11, Life, Naples Botanical Gardens, Parable, Plan B, Plans, Vacation. Bookmark the permalink. Pingback: 4:58 am. And Inspired. – Lead.Learn.Live. I’m glad to have company in the land of Plan B! We should revisit this in the coming months (years?) and marvel at what God did. I pray that we all have a mighty story of God’s perfect plan even when ours don’t go as we expected. Yes, Marney, let me know! I enjoy your thought provoking blogs and the responses from your fans. I especially like “Watch and Wait” to see what surprises God has in store. They are bound to be good because He is good! I was thinking about God’s plans too, Caddo. Sometimes I think we imagine that if we miss his best plan, we’re stuck in some less than ideal mode for the rest of our days. But, as you and Larry point out, God takes our worst moments and does great things with and through them. Your wise advice to wait and watch is a faith in action. Thanks and blessings to you today, Caddo! I just read a post about Joseph, then another about success being in our obedience to God, and now here, at lessons from Plan B! God is surely telling me something .. thanks Judy! God bless you and your faithfulness to share with us! Sometimes Plan A and Plan B can be the same in general terms. Plan A might be “sucess”, and Plan B might also be “success”, but measured very very differently. Glad you had your “Bonus” day! Glad you enjoyed your time away. I like that Rosy – thanks! I have had so many I can’t remember them all! LOL! Same here. I’m not even sure I remember my former plans! I do remember, however, that raising children was a very instructive exercise in “plan B” for me. They didn’t always cooperate with my plans for them. Ha! God’s plans for them are much better, I now realize. Thanks Naphtali! Most of my Plan B moments were earthly bad for me at the time and heavenly good for me in the long run. But so far, none have equaled Joseph’s Plan B trip to Egypt, then three years in prison, and finally second in command over Egypt. So true, Larry! Joseph’s life is about as bad a “Plan B” event as I can imagine. I wonder if there’s a correlation between the depths of our Plan B experiences and the heights to which God can use them for his good purpose?